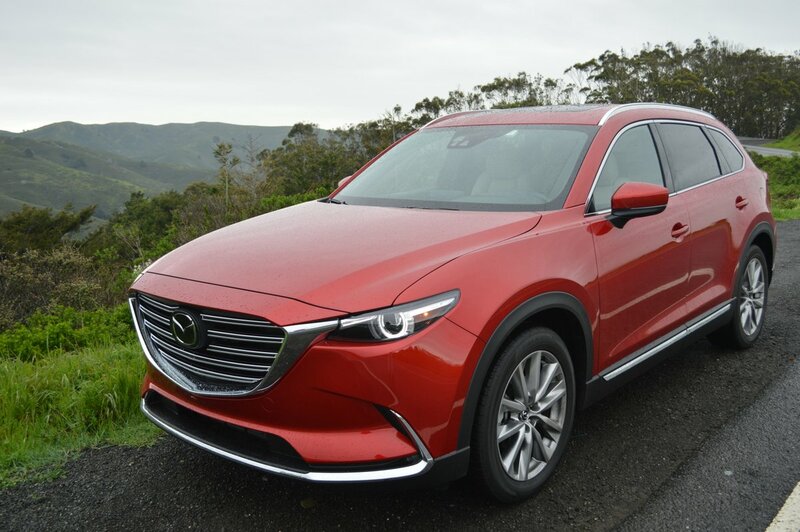 Introduced in 2016 as a completely new model, Mazda’s CX-9 moves into its second year of production in Hiroshima, Japan virtually unchanged. In the multinational automotive world, it has become increasingly difficult to detect where your vehicle is produced. 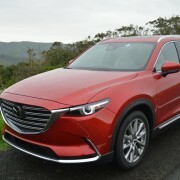 But those who value traditional Japanese craftsmanship can rest assured that the body, engine and transmission of the CX-9 are all constructed in Japan. This heritage shows in the vehicle’s neat overall design, attention to interior surface detail, and lively turbocharged engine. 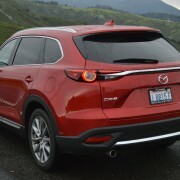 Although the CX-9 weighs in at more than two tons (4,280lbs. 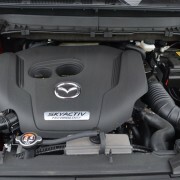 ), Mazda’s first ever use of a turbo on their Skyactive engine line boosts output of the 2.5 liter straight four to a gratifying new level: 250hp and 310lb.-ft. of torque. Couple this punch to a 6-speed automatic capable of manual gear selection and you’ve got yourself a potent straight-line performance package. 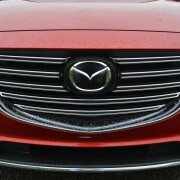 Nor does Mazda drop the ball when it comes to suspension layout. Fully independent design front and rear endows the CX-9 with the ability to soak up bumps and road imperfections with aplomb. Ride comfort is uniformly excellent. Standard front and rear sway bars inhibit lean in corners. Generous 20 inch alloy rims plant grippy Falken Ziex C750 radials (225/50R20) at each corner. 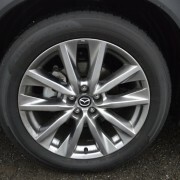 The Tread Wear 300 rating of these tires prioritizes handling, so it’s fair to say that Mazda infuses even this 7 passenger bus of an SUV with the sports car responsiveness of the company’s milestone MX-5 Miata. 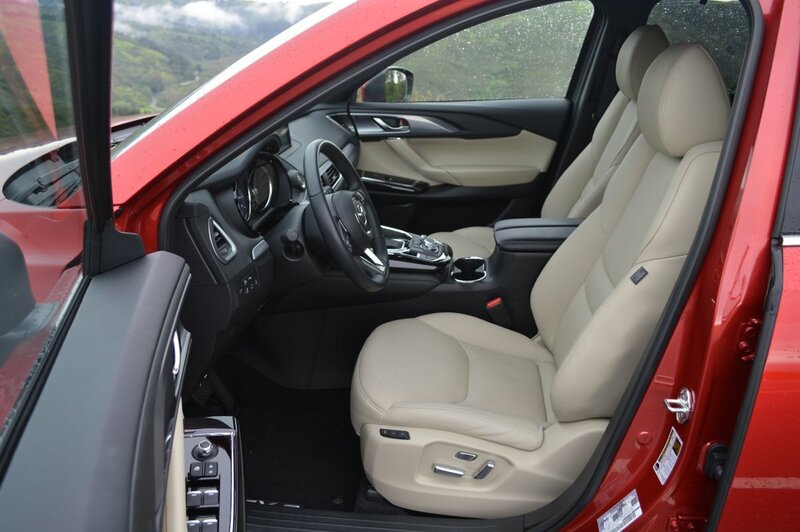 The CX-9 includes three rows of seating for 7 passengers. Front row occupants enjoy exceptionally comfortable and well tailored lounge chairs complete with 3-stage heaters. Mazda has fitted the driver’s seat with a 2 position memory setting. The second row consists of a 40/60 split bench good for 2 or 3 passengers, while the knee-room restricted tail bench is best suited to small fry. Both back rows can be instantly converted to semi flat floor configuration good for 34 cubic feet of storage. I found that dropping the third row bench flat, along with just one of the second row chairs, created enough room to stow an adult bike inside the CX-9. 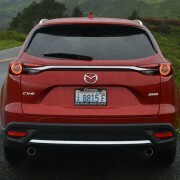 However, the upper cab taper of this SUV makes the handlebars a tight fit through the electrically activated tailgate. While rearranging the interior seats, I discovered a large flat storage bin thoughtfully hidden behind the third row seats. Under that bin lies a deep well housing a temporary spare tire (bonus points to Mazda) and the tools to deal with it. However, the spare wheel houses a huge Bose subwoofer which is bolted in place. You might want to rehearse the drill of removing the subwoofer before you need to do so on some dark and stormy night. 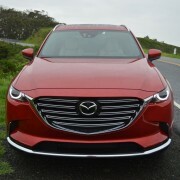 If the CX-9 has a shortcoming, it lies in the layout of the controls for the HVAC system, and to a lesser extent, the infotainment logic of the “Mazda Connect” interface. 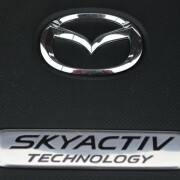 The HVAC controls (Mazda calls them “Automatic Climate Controls”) are inconveniently situated on a small panel located out of your line of sight, just above the center console. 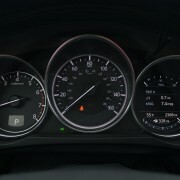 Commands for fan speed and air flow position are scattered along the bottom of this panel, with pictographs so minute that their operation diverts your attention from driving. Likewise, the system used to install “favorite” channels from SiriusXM is unnecessarily complicated. Each time you are prepared to install a favorite channel, the system presents you with a dialogue box inquiring whether you want to relocate the existing channel to another position. We finally gave up on this nonsense after about 10 minutes and stuck with just one channel (’50s on 5′) for our whole week with the CX-9. 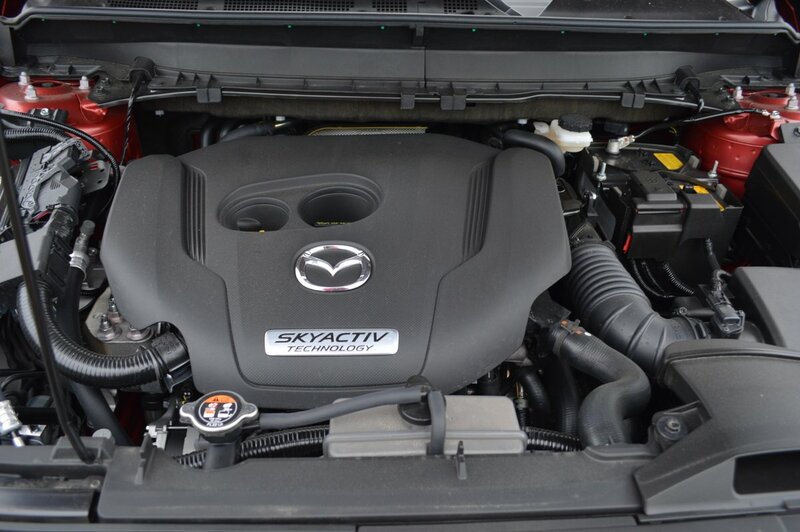 This Mazda is well suited to towing moderate (3,500lbs.) trailer loads. 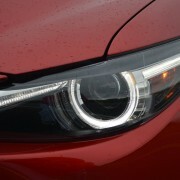 Most importantly, it has the engine strength to get the job done, even over the Sierras. 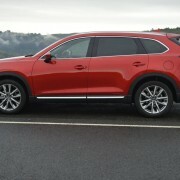 Mazda has provided standard trailer stability assist, plus an 8 inch full color dash top display for the view out the back. 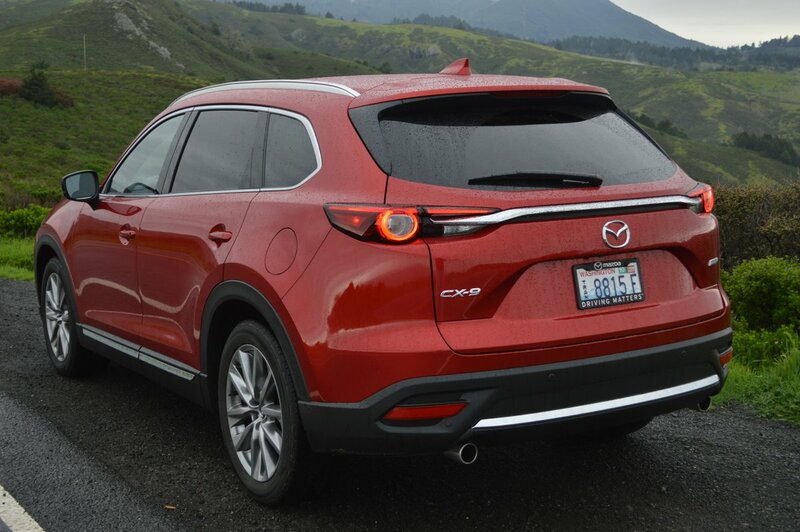 This will ease your anxiety when backing the CX-9′s optional hitch onto a tiny trailer ball. In fact, this spacious and comfortable Mazda is just about perfect for towing your ski boat, sail boat, formula race car or tiny camper. It provides all the comfort and convenience features you could possibly desire, and does so with an efficiency rating of 24MPG (overall) that rivals much smaller but less useful sedans.